So I finished stitching the remaining tail feathers in place on my Civil War Bride block. Then I gave the bird’s feet and beak a bit of thought. The pieces were just too tiny and detailed to use cotton fabric to applique. I have a good selection of Ultra-Suede and found a color that I would imagine a bird’s feet and beak to be. I cut the feet and beak pieces out of freezer paper and ironed it directly onto the Ultra-Suede. I carefully cut the pieces out and stitched them in place. I decided the pieces could use a bit more definition so I very carefully drew around the very edge of the Ultra-Suede with a brown Micron permanent marker. The right foot has marker on it and the left one doesn’t. Can you see the difference? Gosh, you’re good! I’m gonna start calling you Speedy! I passed your blog onto a blogger friend today for starch appliqué lessons! And, I forgot to tell you how beautiful it is! 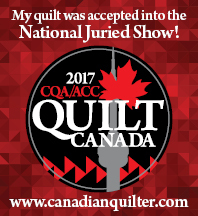 Have you ever entered your quilts in the AQS shows? You should think about it…your work is perfect! Thanks Missy. I meant to enter a quilt in the upcoming show but I did not get my act together in time. Maybe next year! What a great idea to use ultra-suede, love the colours you have used. Thanks! The ultra-suede was a lifesaver! Incredible work! You are moving along so quickly! Thanks! These blocks do go quickly, unlike my Friends of Baltimore blocks…which take a lot longer!